Published on 25 February 2007. Tessa Jowell promised Parliament and the country that the cost of hosting the Olympics would likely be £3.6bn – and, just to be sure, she’d plan for it to cost up to £4.5bn, as there was a ‘risk’ that it ‘might’ end up costing that much. But, throughout the bid process, she assured us repeatedly that the plans were properly costed, and that she had planned for all eventualities. The budget would not be overrun in the way that almost all public project budgets do, and to the extent that most modern Olympic budgets do. If just couldn’t happen, because Tessa had done her sums perfectly. Now we’re told that it will cost up to £9bn. That, as Ms Jowell may or may not realise, is significantly more than she said it would cost. She promised us all that the extensive work she’d done would mean that this wouldn’t happen. Yet it has. And, predictably, Ms Jowell hasn’t planned for it. 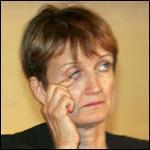 Experts predicted that the Olympics would cost much, much more than Ms Jowell’s predictions. She dismissed them, saying that she knew best. She didn’t. Now she’s in a sticky situation. Maybe she should resign. Not that it would achieve much, but it would be a recognition that she’s not delivered. But since when did ministers resign over matters of policy? With the honourable exception of the late Robin Cook, that’s just not the New Labour way. The New Labour way is to grab a mug of tea, take the happy pills, and try to embarrassingly ‘engage’ with the public at large. Hazel Blears would fit right in as Deputy Leader. She’s exactly the kind of self-obsessed, perma-smile, flower-on-the-lapel, own-world-reality New Labour idiot that seems to gratify Westminster’s New Labour idiots right now. For the good of the country, I hope Gordon Brown doesn’t go soft. New Labour needs a good boot up the backside, and he could be just the guy to provide it. But Hazel Blears is hardly the sidekick he needs. This 1,073rd post was filed under: Politics. Comment posted at 01:01 on 25th February 2007. How long have you hated women? Have yoy thought about seeking medical help? Comment posted at 01:06 on 25th February 2007. I don’t hate women – I merely dislike these particular women.